Are you or your loved ones Feeling lonely & under appreciated? Feeling underutilized and without purpose? Many older adults are at a risk of developing mental disorders, Substance abuse problems, elder abuse etc. It is critical that they have access and are able to get Mental Help. Often elderly people struggle with mental health issues about dealing with retirement, depression, and loneliness, anxiety about health issues, dementia, and substance issues. Often many senior citizens undergo elderly abuse. Dealing with the loss of a spouse and other close relatives too is a major cause for depression. There are a large number of Psychological and Emotion problems that the elderly today face. How Can We Help With Counselling for the Elderly? Our Counselors evaluate and understand the problems, and accordingly make a therapy plan. Goals of counselling are established. 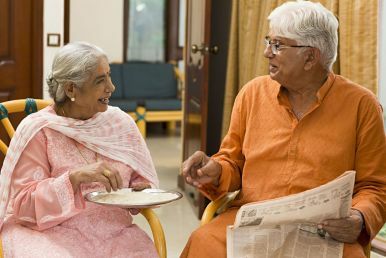 Various emotional and behavioral techniques are used to help the elderly cope with stress, anxiety, depression and other distressing emotions that they are going through. Often senior citizens need help in adjusting to new life changes such as retirement, loss of a spouse, and decline in physical health. Our Psychologists will help you via online counselling to cope with such challenges that come at this stage of life.